"The Walking Dead" season two finale: What happened? (CBS News) The season finale of AMC's "The Walking Dead" featured an all-out zombie vs. human showdown that left some of the gang dead. Hershel Greene's kooky step-nephew Jimmy and Patricia both bit the dust in the finale, but unlike the killing of two main characters in the episodes leading up the to the finale, the killing off of Jimmy and Patricia didn't cause a stir. The drama kicked off when the crew discovers a multitude of zombies at the farm. 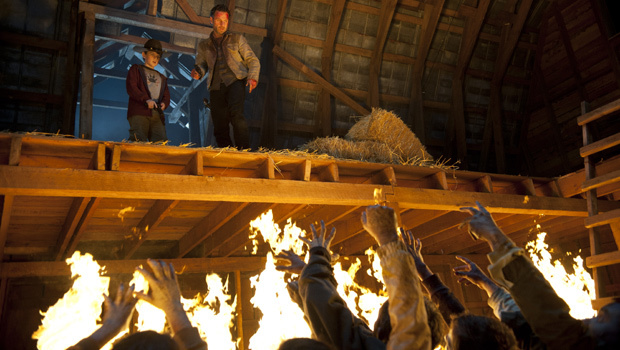 Rick pours gasoline all over the barn and lures some of the walkers inside, lighting the whole place on fire. Hershel says he will die on his farm like the captain of the Titanic, but is saved by Rick who convinces him to leave. While everyone goes in separate directions to fend for themselves, Andrea finds herself in the woods where she, of course, stumbles upon walkers. She is rescued by a mysterious robed figure, who was wielding a sword and walking along with a pair of leashed pet zombies - leaving the audience with the episode's first big twist. The finale ends with another twist/mystery. As the gang gathers around a fire, Rick gives a speech and invites anyone who does want to stay with the crew to leave. No one moves. "No takes? You're staying? This isn't a democracy anymore," he says. The camera then rises to reveal a fort/prison in the near distance Could it possibly be the setting for season three? We all will have to see. Tell us: What did you think of "The Walking Dead" season finale?